If you’re new to Judaism or looking to learn how to share more Jewish practices with your family, Shabbat is a great place to start. It’s the Jewish holiday that happens every week, encouraging you and your family to take time to rest and relax, to enjoy family and friends and to put all those to-do lists, work and daily worries aside. Shabbat offers time for much needed perspective after a busy week, a spiritual day that feels different than every other day. There are infinite ways to celebrate this weekly holiday and just as many reasons to create this safe, easy space in the life of your family. 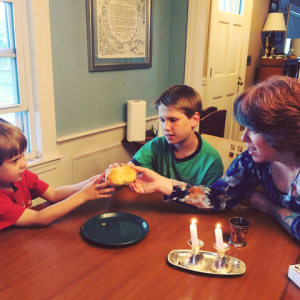 Around the world, every community and every family has their own Shabbat traditions. 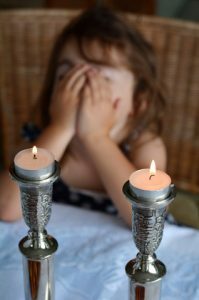 There is not one single way to celebrate Shabbat, so don’t worry that you’re going to do it incorrectly. Shabbat can be a time to eat a special meal, to ask your family about their past week and the week ahead, to feel gratitude for those around you and just to breathe. People of all faiths can join in your Shabbat rituals. First, remember that Shabbat is always there for the taking and that it does not require special food, flowers, clothes or music. Though it can be a nice way to set the day apart from the rest of the week whether it’s with the food you eat, your clothes you wear or something else. Take one step at a time, start small, one blessing, one family question to reflect on, something that makes this day different from all the other days of the week. Many families also choose to celebrate Shabbat with their synagogue communities on Friday nights or Saturday mornings (see this booklet: What to Expect at a Synagogue). This can be a great way to feel connected to other families and enhance your Shabbat experience. There are also many traditions and rituals that have evolved that you can include in your home celebration. Remember that all these traditions and rituals were created to enrich and enhance the celebration of Shabbat. Some might work for your family, some might not. They are a good place to begin, but you can surely add your own traditions or ideas, including elements from a family member’s faith tradition other than Judaism (think: food, prayers, rituals). Shabbat happens every week, no matter what, so you’ll have plenty of opportunities to figure out what works best. Many people choose to begin by gathering the entire family for Friday night dinner. 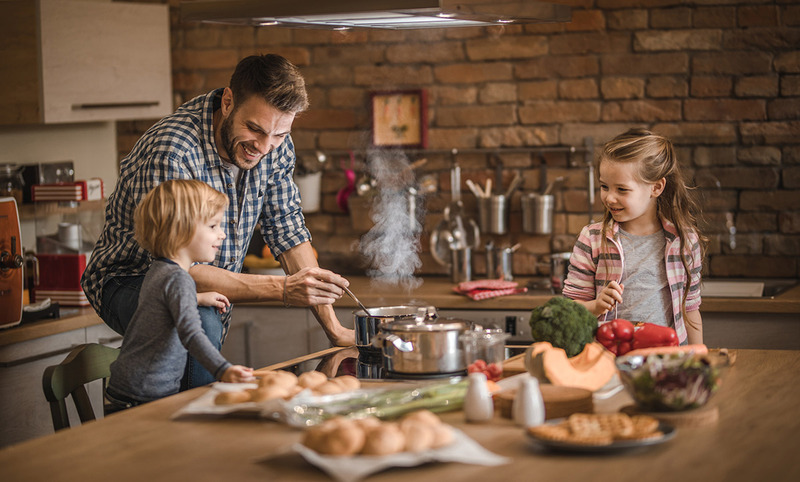 With the pressures of long hours on the job and lengthy commutes, sports practices, appointments, household tasks, etc., having a relaxing family dinner is a great start to the weekend. Every family has different traditions for their Shabbat meal. Just remember, the goal of Shabbat dinner is not what’s on the menu (that can be its own source of stress! ), but rather the intention of the meal. So roast a chicken, order a pizza, go out to your favorite restaurant if that’s the easiest way to get everyone in the same place, and appreciate the time you have together. Shabbat is a wonderful time to celebrate your family’s cultural differences. Find interesting multicultural recipes here. Friday evening is a time to awaken all your senses around the dinner table. But before you eat, tradition tells us to pause and acknowledge that this evening is different. We set two candles out and as we light them we invite Shabbat to enter our home and surround our family with rest and joy. While postponing dinner can be tricky with little ones, you might find that they enjoy this special ritual. Some families observe the custom to light the candles and then cover your eyes while saying the blessing. This gives your family a chance to see the world transformed by the light of the candles when your eyes are opened at the end of the blessing. Some wave their hands over the candles as if scooping up the holiness of the flames. Either way, your kids will get into the hand motions. Two candles are traditional but some families add extra candles for every family member. One does not need to be Jewish to join in the blessings on Shabbat. You can also find more comprehensive information about the holiday and blessings in this guide. Once we welcome Shabbat by lighting the candles, it is traditional to offer blessings to our family, to those around us who are sharing Shabbat with us. Below is the traditional Hebrew blessing for children and other guests, but if it doesn’t speak to you or you aren’t comfortable speaking Hebrew or with God language, feel free to offer your own special words of gratitude and blessing to your friends and family. This traditional blessing recalls our Biblical ancestors in the hopes that our children will be like our strong, compassionate, foremothers and fathers as they grow. Challah is special bread for Shabbat. It can come in many shapes and sizes and even flavors. It can be a fun activity to make with your kids and a great opportunity for family members who are learning about Judaism to get more involved, but you can certainly also pick it up at many local grocery stores. If you can’t find it locally or just are having a busy week, you can use any bread product. Once the blessings are said, sit back, relax and enjoy your Shabbat meal with your family. Take the time to ask about everyone’s day and really listen to the answer, plan a walk outside after dinner or the next day, think about the things in your week you’d like the leave behind and those things you are looking forward to in the week to come. Smile, laugh, breathe and relax. On Shabbat we have the opportunity to just be, to have the (sometimes) rare opportunity for the whole family to eat together, to appreciate the family we are part of, the people we love. Finally, on Shabbat we greet each other by saying Shabbat Shalom, which means, Peaceful Shabbat. So however your Shabbat looks, may it be a day of rest and peace for you and your family. Shabbat Shalom! 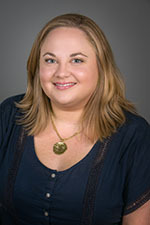 Rabbi Jillian Cameron is the director of adult learning at CJP in Boston and is the former director of InterfaithFamily/Boston. She was ordained at Hebrew Union College - Jewish Institute of Religion in 2012 after receiving a Master's Degree in Jewish Education in 2008. << Previous: Why Do I Worry My Daughter Won’t Fit In?